On the 4th of July while many Americans were grilling and chilling, I was peeling and chopping and sweating and braising. Even if our grill were ready for action, it was too freaking hot to stand out in the blistering sun flipping burgers and dogs. I’m not complaining about pulling kitchen duty on a holiday though because without meaning to, I found my ultimate pot roast/beef stew hybrid. Yes, this recipe requires a long lead time from prep to table. But the amount of time actually spent standing at the stove is minimal. In fact, I started watching Independence Day while the onions slowly caramelized. When it was time to sear the beef, I hit pause on the Tivo. I browned, deglazed, simmered, and transferred everything to the oven. And then I finished watching the intergalactic smackdown from the comfort of my air-conditioned living room. By the time the world had been saved from the space invaders, Pot Roast Carbonnade was ready to come out of the oven. My work, besides boiling up some egg noodles, and taking the credit for a fantastic dinner, was done. I’ve got a few other beef stew recipes in my files but from now on I’ll be making Pot Roast Carbonnade when I’m in the mood for roasty, stewey goodness. Because if there were only 36 hours left before complete annihilation of the human race, this is one of the dishes I’d want on the table at my last supper. BAH Note: The beer, caramelized onions, prunes, and bacon combine to give this dish a slightly sweet, complex flavor. While the juices are luscious and silky, you will want to skim as much fat off the top as you can. Check the amount of liquid in the pot after one hour of cooking. If it is low, add additional beef broth or water. 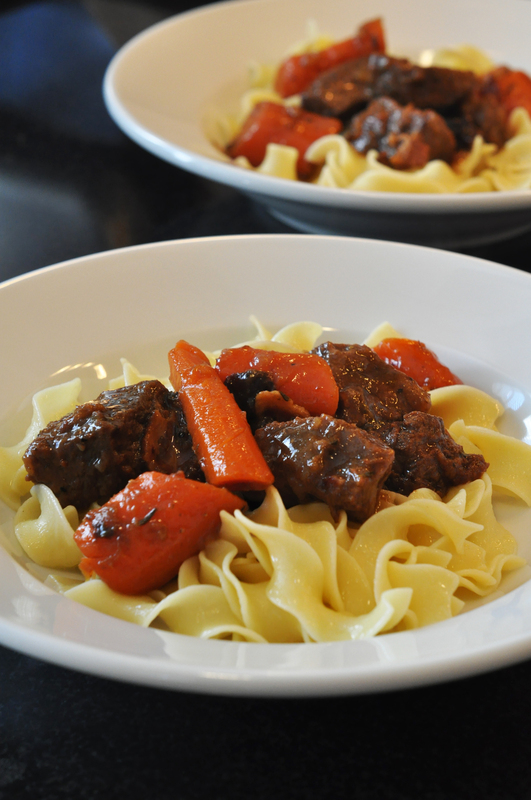 Serve this with hearty bread or buttered noodles. BAH Tip: Be sure to dry your chuck with paper towels before you cut it into cubes. The drier your beef is, the better it will brown. In a large dutch oven, cook the bacon over medium low heat until it renders off its fat and becomes crisp. Using a slotted spoon, remove the bacon from the pot. Add the onions to the pot and cook over low heat, stirring occasionally, until they are caramelized, approximately 45 minutes to an hour. When the onions are done cooking, heat your oven to 325 degrees. Use a slotted spoon to remove the onions from the pot while leaving the bacon fat behind. Add the vegetable oil to the pot and, working in batches, sear the cubes of beef until nicely browned all over. Return all the beef cubes to the pot along with any accumulated juices. Add the onions, carrots, bacon and prunes. Add the flour, stir it in, and cook for about one minute. Add the beer and use a spatula to deglaze the bottom of the pot. Add the beef broth and thyme and bring the mixture to a simmer. Cover and transfer the pot to the oven. Cook for two hours or until the beef is extremely tender. You made this dish in the summer? You renegade! Looks yummy! My daddy-o would flip for this. Wow those chunks of beef looks so tender and delicious! It’s rainning here so this recipe will work so well. I wanna try this soon. Tes, that beef was tender and delicious. It was totally worth having the oven go for two hours in the middle of the summer. excellent choice of Beer! Love blue moon and orange slice! my pot roast is not so labor intensive. 6. serve with sides of choice…..
Ps1. this can go in the crock pot too bu then you have to wash the insert! PS my oven runs all year round. In Texas NOBODY is gonna stand inthis hear and grill! Not unless you are a native! Emily, Blue Moon with orange slices is a winning combo in my book. And while I’m not suggesting you mess with what works for you, this pot roast carbonnade is heavenly…just in case you ever decide you want to shake things up a bit. by the way the religious reveres are praying that you see the light about that LOL! Emily, you don’t even know there are prunes in this. They totally break down during cooking and infuse the sauce with a subtle sweetness and depth. Emily, it’s a good thing somebody is praying for me. Even if it’s just to be more open minded about stuffing cabbage rolls with chicken!